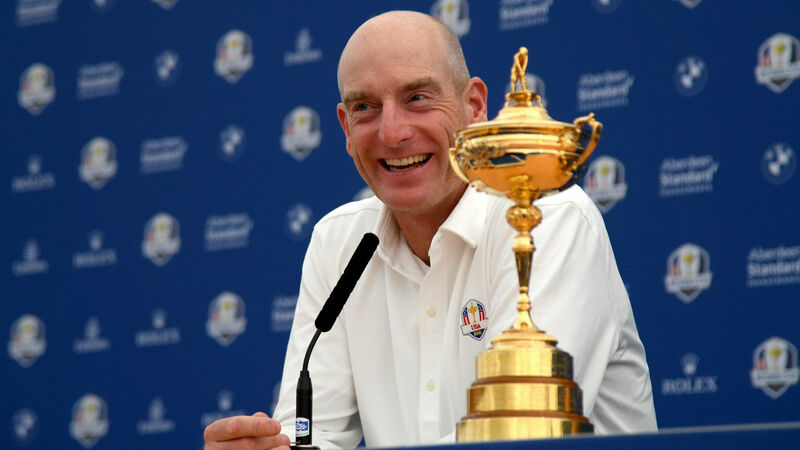 SAINT-QUENTIN-EN-YVELINES, France — United States Ryder Cup captain Jim Furyk believes Tiger Woods is fully focused on enjoying success in a team environment after ending his personal victory drought Sunday at the Tour Championship in Atlanta. More than five years after his most recent PGA Tour win, a rejuvenated Woods completed a sensational comeback from multiple back surgeries by claiming an emotional victory in the final event of the FedEx Cup season. A long-awaited 80th PGA Tour triumph sparked delirious scenes at East Lake, where the 14-time major champion was surrounded by a sea of spectators as he made his way up the 18th fairway. Yet while Tiger’s Tour Championship glory was understandably the main talking point in Monday’s opening news conference at Le Golf National, Furyk insists the former world No. 1 has quickly turned his attentions to this week’s even bigger event. Woods often has struggled to deliver his best in the biennial matches between the United States and Europe, but Furyk said: “When you look at now, maybe comparing past Ryder Cups to this one, I think what’s so special is Tiger has ingrained himself in our team atmosphere. “He became such a big part of the team in 2016 as a vice-captain, and then again in 2017 as an assistant captain at the Presidents Cup. I think it’s special for him now to join these younger players as a team-mate. “What’s important for him right now is to be a part of that team, a part of that group. As Thomas [Bjorn, the European captain] talked about, it’s a 12-on-12 type of atmosphere, and I think he really enjoys that right now. Furyk sparked laughs in the interview room when he was first asked about Woods’ headline-grabbing victory in Atlanta. Addressing the success of Woods with more seriousness, Furyk added: “Obviously Tiger played so well. He’s played really well all year. It’s obviously a nice buzz for our team … the crowd on the 18th fairway yesterday was amazing.